Bugging technology has become easily available to the general public and not only in Reading and the surrounding areas. This, in turn, has made bugging a phone, computer or fixtures and fittings in your home or at work simple and straightforward for dishonest people. Our electronic bug sweeps in the Reading area are the perfect countermeasure that will detect, remove and destroy the offending devices. 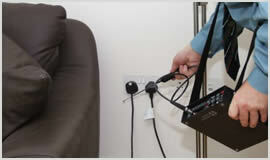 Our discreet professional investigators in the Reading area keep up to date with state of the art Electronic Bug Sweeping equipment that can uncover the presence of unwanted devices in your home, work premises or vehicle. We have had many delighted and reassured clients in towns such as Caversham, Shinfeild, Emmer Green, Hurst, Spencers Wood, Burghfield, Arborfield, Winnersh, Emmer Green, Purley on Thames, Calcot, Swallowfield, Burghfield Common, where our services have been applied. In many cases our investigations have given the answers to many questions and also provided the solution to many puzzling situations. Call our Reading branch today for peace of mind.